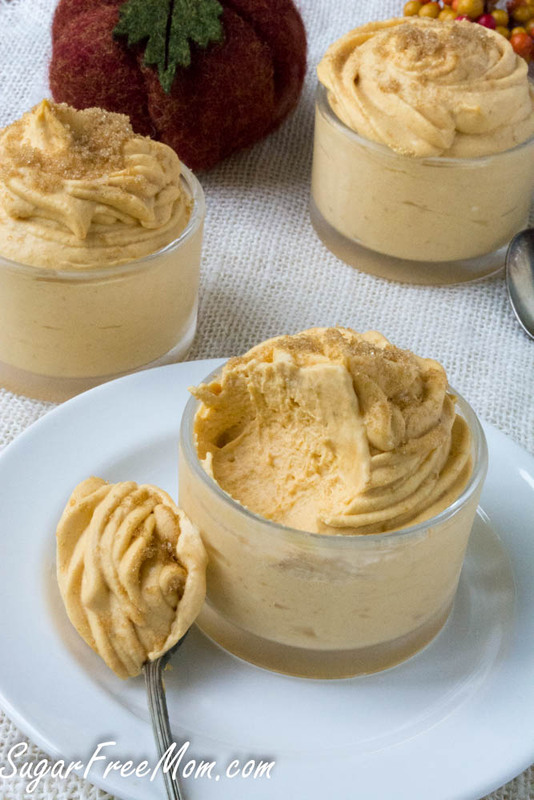 This Easy, No Bake Sugar-Free Low Carb Pumpkin Cheesecake Mousse is a pumpkin and low carb lovers dream! 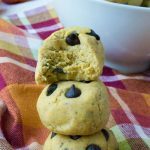 It’s gluten free, keto and made with just 6 ingredients! Pumpkin season has arrived! 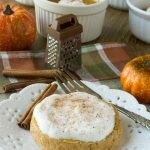 Creamy pumpkin cheesecake flavor but with a light and fluffy texture that is irresistible! It doesn’t hurt that this fabulous dessert is also low in carbs either does it? Since this recipe has been a super popular one on my blog since first being posted September of 2013, I knew it needed to be back up in the forefront with some updated photos. 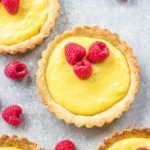 So those who are new to my blog and those new as email subscribers can enjoy this easy 6 ingredient deliciousness! While it’s not a new recipe it is my first pumpkin recipe I’m sharing of the season and a video was needed! 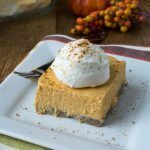 Be ready for more recipes to come and make sure you have some canned pure pumpkin on hand, not the prepared pie filling stuff either, just plain pureed pumpkin please. Boy that is a lot of P’s!! Seen here topped with some Sukrin Gold (brown sugar sub). 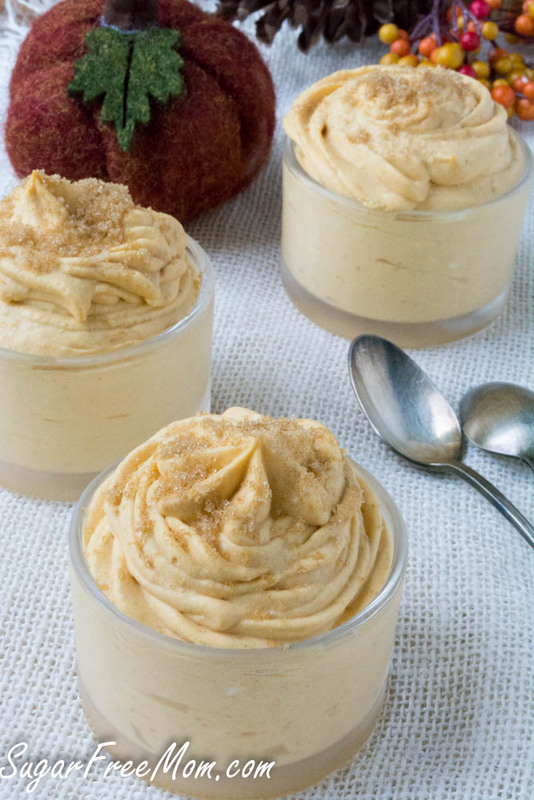 It really is so quick and easy to make for a light dessert anytime. And who doesn’t love a no bake type recipe right? I’m a lover of cheesecake and all things creamy like mousse! 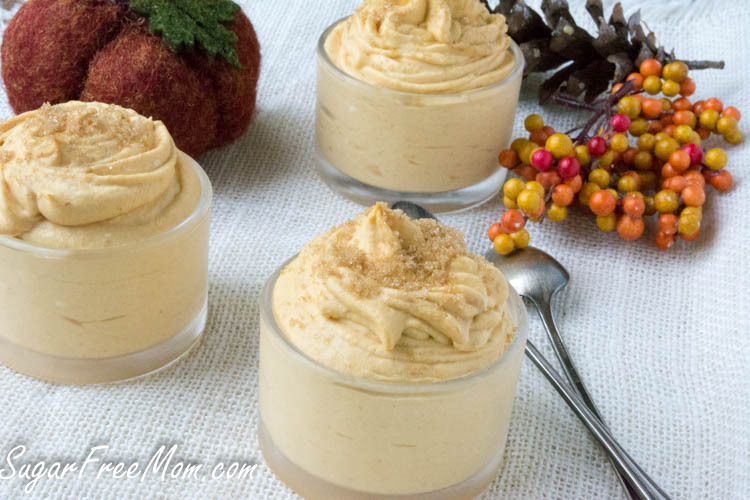 I just recently shared my Peanut Butter Mousse which tastes like a peanut butter cup as my hubby stated! 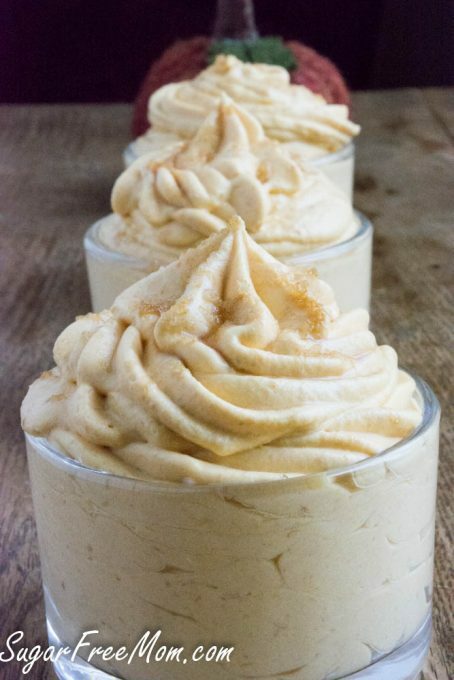 I’ve got some other mousse flavors you might enjoy if pumpkin isn’t your thing. 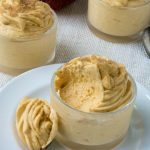 Try my Butterscotch Cheesecake Mousse, Cappuccino Cheesecake Mousse, Mocha Mousse, or my Coffee Ricotta Mousse all fantastic choices! You don’t have to use a piping tool to make the mousse swirl in the glass, but it makes it oh so much prettier. I, for one, am not good with a pastry bag so I bought a Wilton Dessert Decorater gadget I love and helps me tremendously. Yes a pastry bag might be nice to just get to throw away, but I don’t have the talent for using it. Look how easy this is! I doubled the orginial recipe and changed out the neufchatel cream cheese for regular cream cheese, but feel free to change the cream cheese to whatever kind you typically buy. If you don’t have pumpkin pie spice or can’t find it, substitute the following for the amount I used: cinnamon, ginger, nutmeg and allspice. Surprisingly even my kiddies were won over with this dessert and I thought it would just be for the adults in the house, HA, I was very wrong! The kiddies loved it and I had to share. But with only 6 ingredients needed, you can make this anytime at all. The original recipe served 8 but now you’ve got plenty to serve as a dessert like seen here or use as a frosting!! Next week I will be serving up a brand new pumpkin recipe topped with this as it’s frosting. You won’t want to miss it so be sure you don’t. Best way to ensure you never miss a recipe is being subscribed to my blog. Original Recipe first posted in September of 2013 with updated photos in September of 2015 and today a Video to show how easy this recipe is! 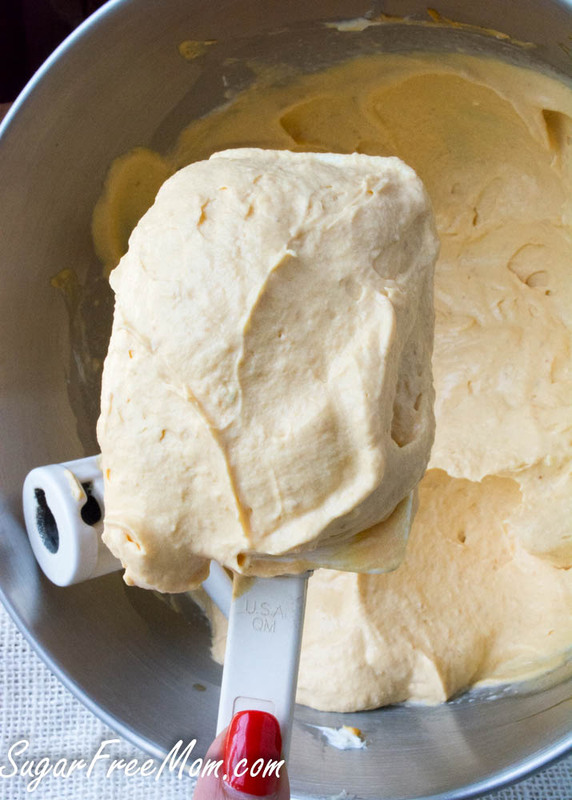 In a KitchenAid or stand mixer blend cream cheese and pumpkin until smooth. Add the rest of the ingredients and blend until whipped and fluffy about 5 minutes. Taste and adjust sweetener to your liking if needed. Pipe into serving glasses and top with cacao nibs or brown sugar sub like Sukrin if desired. Best if Chilled about an hour to set and thicken but still fantastic to enjoy immediately! The Sugar-Free Mom Cookbook has been Released!! Amazon is selling it at a discount right now! I noticed a lot of your recipes call for liquid stevia…does it need to be liquid or can I use the packets? No of course you can use the powder as well, I like the liquid flavored the best though. This looks yummy, but I can’t use stevia. Do you have a conversion for using sugar and one for Splenda? Thanks! You can Google for conversion charts for any sweetner. What size can of pumpkin puree small or large? Lisa: You are the first person I have heard who said that they cannot use Stevia-what is the issue? Xylitol and Sucralose both give me terrible, even debilitating gas, but, I have never had an issue with the good whole foods market type stevia. I am just curious if there is a symptom that I am not associating with it. I have many environmental allergies, pollen, molds, dust,and ragweed. I’ve been using stevia for 11 years without issue. I get migraines from stevia…only aartificial sweetener I can use is sweet n low. Use a small amount then taste and adjust. I can’t use it either i get an awful migraine every single time I’ve had it. And i think it’s the only food I’ve ever had a reaction to. I can’t use Stevia either. I get horrible cramping and diarrhea, gas and terrible bloating all within minutes of ingesting it. It is the only sweetener I get this with. How strange that many react to stevia. I wonder if it’s the type that is used. I’ve seen some experts say not to used the highly processed stevia, so I wonder if a more natural form would work. Something that is basically just the dried herb, powdered. I’ve never ever had any reaction to stevia. The brand I use is Organic Sweetleaf. I cant use Stevia either. I put in in a recipe and it crashed my blood sugar. ( To be fair mine runs pretty low normally). I have to avoid it. I’d love to try this recipe, I just need to modify a sweetner. It’s not the ‘type’, it’s ALL stevia. I react horribly and will not consume it. I react to all sugar subs. Fortunately I’m used to not needing sweeteners. Ha I can’t have stevia either! (I just sub in Splenda). Stevia gives me the worst stomach pains ever!!! It’s neat seeing so many others that can’t have it too! A lot of people can’t use stevia. I can’t either. I get hives all over the place. I use concentrated sucralose generally which has no maltodextrin fillers. But 1/6 of a teaspoon goes a long way! Hi can I use the pumpkin spice stevia instead of the vanilla? can a person that is diabetes can have this ? Not sure how to make my own comment but mine came out runny. 🙁 I don’t know what went wrong. Oh, yum! These look delicious! I’m going to try this today! I have an opened can of pumpkin I need to finish. Thanks for this recipe! Can you sub Neufchatel cream cheese for regular? Does that impact the outcome? I don’t think it would matter to be honest. I tried to save this but it would not work. Ok thank you I will let the web designer know. Yumm!! BTW – love the new site layout!! Thanks for this one…off to order some liquid vanilla stevia! Anything else you order from iherb? By the way…your print button on the bottom is not working and the green print button on the top goes to pinterest…. nothing, it’s just full of sugar. How did it do in the freezer? I would like it in a Popsicle or ice cream. can you sub the heavy cream for almond milk? I’ve not tried it but please let me know if you do and how you like it. What if I used Creme of coconut instead of heavy Creme. I just read your article on the coconut. I think that would be a good dairy free alternative for sure. That’s awesome, sounds great Sandy! Maybe the food processor or blender but by hand may be tough! Hi there! Would a hand blender work?? I have the stevia for baking…can that be used and if so what would the conversion from liquid to powder be? Hey Jennifer, How much powdered splenda did you use? Hi Jennifer or Patricia I want to try this for my mother-in-law and several other family members for Thanksgiving if you can let me know how much Splenda you used I would appreciate it so much. Thank You!! 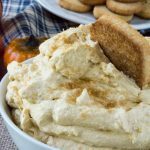 I tried this recipe and followed it exactly, my cream cheese was room temp. (recipes usually call for this), and used the powdered Splenda, but it came out like pumpkin soup! Like a thick soup, but couldn’t pipe it. Not the consistency of whip cream at all. I whipped up the rest of the cream I had and mixed it in, which made it mostly whip cream and only barely able to pipe it out. Still not like it should be. What did I do wrong? Should I have whipped the cream first and mixed it together with the other ingredients? Even then I don’t think it would have turned out right. Help! The room temp cream cheese warmed the heavy cream and it didn’t whip as it should. Use refrigerated cream cheese and mix as I said in the instructions with the pumpkin puree in the stand mixer. Once you add the cold cream it should whip in minutes. The heavy cream may take longer depending on the speed you used. You could also whip the heavy cream separately then fold it in. Looks like it makes a lot too! Think I should be able to just cut it in halve…wonder how it would be frozen!? Sandy, did you ever try freezing it? I only have half and half on hsnd. Can I use that, or will it be too runny? Can I substitute lite cool-whip? THe Half & Half will not whip up and thicken the mixture. I don’t use cool whip but you could sub that. I don’t h as very any heavy whipping cream on hand. Can I substitute half and half or Lite Cool Whip? Are you sure the nutrition info is correct on this recipe? When I put it into a recipe calculator, it says that each 1/12 of the recipe serving is 280 calories? Thanks for questioning that. You were right! I had only 1 eight ounce package of cream cheese in my nutrition info. I’ve updated it now, thank you! Mine was runny. Any suggestions? You might not have let it whip enough in the mixer. Did you change any ingredients? Oh man. This hits the spot for sure. I was in a rush trying to make a single serving while the kids are at a friend’s house and the baby is napping, and I goofed it up a little (had thawed frozen puree in the microwave and didn’t let it get cold), but it was still exactly the taste I was looking for. Next time I’ll try to plan ahead of time so I can get the full autumny effect with the right texture! Thank you! Sara, did you use real pumpkin puree Instead of canned? I have some frozen pumpkin puree from our Halloween pumpkin and wanted to use it. Awesome!! This was a great hit with all my family ( in-laws included). Thank you!! So happy, love to hear that! Hi Brenda, this looks delish!! If I may ask, what speed to do you use to blend/whip everything in your KitchenAid? Thanks! I went slow at first on 2 then increased to 3 for a while. This looks yummy! Your recipe calls for cacao nibs, but in your photos it looks like you’ve topped them with something else. What did you use? Thanks for mentioning it as I forgot the orginally photos had cacao nibs on top and these updated photos do not. That topping is a new brown sugar substitute I received samples of to try called Sukrin Gold. Love it! Has anyone made this without sweetener? Curious if it would be palatable without it. Yes! 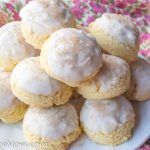 I can not use stevia and do not like the other “sweeteners “… while our kids didn’t love this, hubby and I thoroughly enjoyed this delightful treat! Am I not getting something right here? You say this is a low carb recipe, but 1 package of cream cheese has 3.5 grams of carbs, 1 can of pumpkin puree has 10 grams and 2 c. of heavy cream has 13grams. Your recipe calls for 2 packages of cream cheese, so that’s 7 grams + 10g + 13=30 grams. 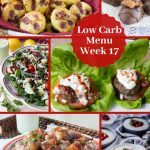 That is considered “low carb”? 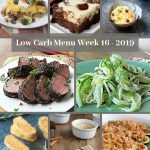 I mean it sounds wonderful and I wanted to try it, but when your only allowed 50 carbs a day…..
ALl of those ingredients are combined making this 12 servings and each serving is 1/2 cup. So if you look at the nutrition info for the carbs per serving at 1/2 cup it is 4.2 grams. You’re not going to eat the whole recipe at once are you? You have to divide the 30 grams by the number of servings. I must be crazy or confused. I thought for sure I saw somewhere that you used only one 8 oz cream cheese and not the 16 oz. I used only one and I thought it turned out pretty good. What would the difference be if I made it with 16oz of cream cheese? You’re not crazy lol! In the original recipe I used just 8 ounces but I redid this one and took new pics and made MORE so I increased using 16, still comes out fine but you get less servings. thank you, it was very very good. I don’t have a stand mixer. Can I use a hand mixer instead? Thanks! I’m sure that would work. This is Beautiful and I will make it……but, we’re did you get the cute containers you put yours in? Oh gosh I think I got them as a gift one Christmas, no idea, sorry! 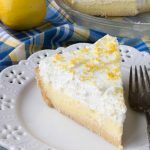 Is this recipe thick enough to put in a low carb pie crust and serve as a pie? I make my own pumpkin puree. Any idea if that 15oz can is weight or fluid ounces? Trying to figure out how much homemade & fresh pumpkin I need! Cant wait to make this!! I really don’t know, it doesn’t say on the can, sorry. I can’t say for sure as it’s never lasted long enough to freeze whenever I amke it. Sorry! I tried making this and while it turned out ok I had to add an additional can of pumpkin for the family. Everyone said you could not taste the pumpkin only the cream cheese. Also it took 3 tsp of pumpkin pie spice to give it flavor. Did any one else have this problem. I’m sure this changed the calorie and carb count but that’s ok. It was for a treat anyway. I agree. Thanks for the fix! I agree. I didn’t add more pumpkin but I at least tripled the spice but I like my pumpkin pie spicy. I even added extra ginger and all spice and cinnamon. It could have been my Trader Joe’s pumpkin pie spice though. I never seen to think it is spicy enough. Yes, I agree. 2 packages of cream cheese and 1 can of pumpkin gave it more of cream cheese flavor and you couldn’t taste the pumpkin. Next time I will use 1 package of cream cheese and add more pumpkin pie spice. Exactly my same experience!! I added another can of pumpkin & almost tripled the spice & Stevie. Turned out pretty good. Otherwise, it’s very cream cheese-y. Next time I’ll just do 8oz of cream cheese & 1 can of pumpkin. That’s a tasty ratio. I only need a few servings, not 3wks worth. The first time I made it (while cooking other holiday menu items), I lost track of what I had put in. I think I added an extra cup of cream. It seemed too runny to set up in the frig, so I added a little plain gelatin. Can’t remember how much, maybe a teaspoon. I thought it better to go “less is more” and still be a little soft than rock solid. It worked just fine in a pinch, but I now am more alert to follow the directions. It did occur to me that gelatin might work if you use almond or soy milk in place of cream. Also, since that fiasco, I’ve also tried coconut sugar on top or in the mousse. My husband and I don’t like things really sweet, so I taste test it as I’m adding the coconut sugar. Doesn’t make this sugar free, but somehow I feel coconut sugar is a better addition than cane sugar. Try a favorite sugar substitute of mine.”Swerve” It is diabetic friendly..and mixes and measures just like cane sugar.. No after taste or digestive problems. We love it. My husband is diabetic and it has no negative effect on his sugar numbers. Can this be frozen, then thawed in the fridge to serve at a later date? I don’t think so. I doubt the consistency will keep if frozen then thawed. Sorry! do i pour the heavy cream in a liquid state and whip for 5 minutes with the cream cheese and pumkin or do i whip it first to solidify? I whipped the cream cheese and pumpkin well first, then poured cream in last, in a liquid state and whipped for 5 minutes. so good!!! Made 1/2 recipe in Magic Bullet in divided portions….DH and I LCHF a little over 2 weeks now…so glad for treats….thank you…. sure if you don’t mind no sweetness at all. I like to use Agave syrup as sweetener. How much would you suggest in this recipe? I don’t use agave so I can’t really suggest how much to use as I don’t know how sweet it is. Always start with less than you think and taste and adjust. Hey so I live in the middle of no where and all I could find was pie filling. How would that change the recipe? It’s full of sugar. You would not add any sweetener and it would not be low carb or sugar free. I made this exactly as the recipe said and it turned out perfectly. I was licking the bowl and the whip and realized that it is really very rich for my taste so I put it in 24 dishes and eat only half a serving at a time. So yum! Also… The second time I made it, I added 2 scoops of protein powder and it was just as good. Now I am going to go read the other comments to see if anyone has frozen it. I might just try freezing one. Just because it is a lot of mousse for one girl. I will let you know if it works… If no one else has already. Thanks for the recipe. I live in the United States and both heavy and whipping worked for me. I’m sorry about that. I made this tonight but I never could get it to set up. The cream cheese and heavy cream were straight out of the refrigerator. I stopped it a few times to add sweetener to taste. Would that cause a problem? I am hoping that overnight will help it to firm up. It will firm up once refrigerated but honestly your cream cheese needed to be softened or it just won’t incorporate into the heavy cream at all. In above comments you say the cream cheese must be straight out of the fridge or it warms the cream and it won’t whip. Here you say to soften it (which would at least be room temp). So which is it? I used softened cream cheese which just had been sitting out on my counter for about an hour. I made this with 1/3 cup Swerve and it was perfect. Amazing is an underestimate of how good this is. Call me crazy, for some insane reason I cut the recipe in half. WHY?????????? I have a silly question! 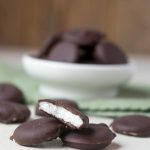 I ordered liquid Stevia after seeing this recipe and thought that I got vanilla but didn’t! I have regular! 🙂 Any thought on what I can add or do to maintain the flavor of your recipe without the vanialla Stevia? ( I do want that flavor though!) I’m so excited about this recipe!!! Regular stevia will be fine, just add some extract vanilla extract. I need to make this ahead with my schedule. Will it still have a good texture if made a couple days in advance? It actually thickens in the fridge even more, be sure to place it in the serving dish or glass before refrigerating. Made this for game day dessert today. Oh MAN! So delicious. I changed up the procedures a little because of all of the comments about getting “soup” instead of mousse. I did start with cold cream cheese directly out of the fridge as suggested You do have to work the cream cheese and pumpkin quite a bit to get them to come together. This working warms the mixture up a bit. Instead of adding all of the remaining ingredients, I added everything except the cream. Then I applied an old trick for preparing whipped cream. I placed the stainless steel bowl and whisk attachment in the freezer for 20 minutes. This chills the bowl and the the mousse. With everything nice and cold the cream whipped right up. I also added some crushed pecans on top. Awesomeness! I’ve made it several times and love it. Any thoughts on how this might turn out if churned in an ice cream maker? I love your recipes. Going to try this one real soon. Next time I go shopping Lol,. Thank you for sharing. Hi Brenda. Do you think I could substitute mascarpone cheese for the cream cheese. I have some in my refrigerator that needs to be used. Many thanks. Yep Half & Half will never whip up. You could turn it into a smoothie instead, add some cocoa powder, protein powder and make a chocolate pumpkin smoothie! Great idea! I put it in the freezer but haven’t checked it yet. Thanks! Thank you for the recipe. It was delicious, especially after being overnight in the fridge. I used 3/4 cup Gentle Sweet (maybe 1 cup if you like it sweet). I would recommend adding your sweetener then taste after whipping. You can always add more. Where do you find flavored or liquid stevia… I have never seen either.. I barely get the plain powder where I am – what would the sugar equivalent be if I replaced it? At least 3/4 cup of sugar if not more to equal the sweetness in 1 tsp of stevia. Wondering if you could reduce the whipping cream a little, and add some Baileys or Rumchata, for an adult dessert? Can you use. Other alternate sugar substitutes, I use equal now? I’m sure you could, as to how much not sure since I don’t know how sweet equal compares to stevia. Followed instructions to the letter. The 5 minutes of KitchenAid mixing after adding the whipping cream… it separated. It looked better after just 1 minute. Hubby said it still tasted great (he’s the pumpkin eater in the house) but I was very disappointed with the end resulting texture. Not a big fan. 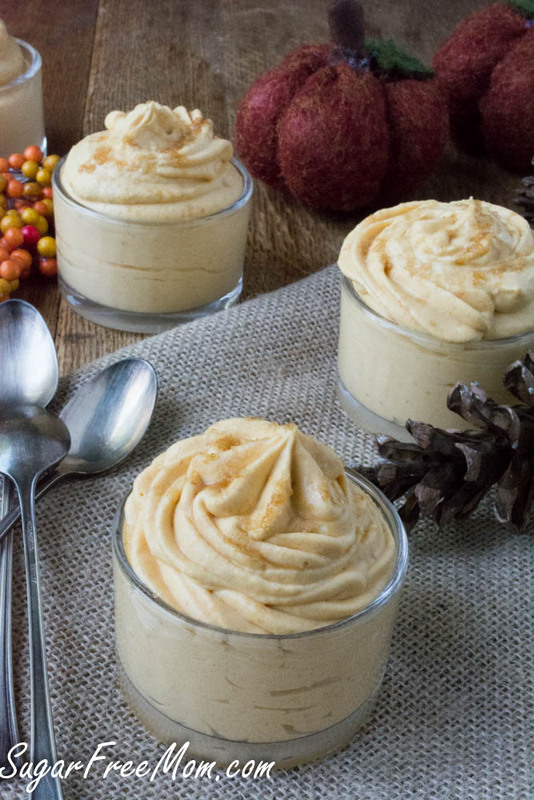 Too much cream cheese taste — may be better with more pumpkin and spice. The liquid stevia unfortunately leaves a horrible after taste. Was going away for a week so tossed in freezer. Froze great! Put in microwave about 20 secs and was just enough. Or leave in fridge to thaw some. Halved recipe and turned out just fine. I didn’t like it as well as pb mousse but still good. Going to make this! Would it be good in a pie shell?? Could I make this into a pie? Like, make as usual, just pipe it into a Keto pie crust instead of individual cups?? I was craving a treat tonight and this definitely hit the spot! I have a feeling this will show up at Thanksgiving dinner. Thank you for the recipe! Can I ask what site you run the macros through? I put it through Carb Manager and the macros came out much different. This has quickly become my T1D adult son’s favorite treat. He wishes I had found this when he was a kid. I am making him a batch to take back to his apartment tonight. Thank you! This turned out great in terms of texture! My personal preference is to keep the cream cheese and pumpkin to a 1:1 ratio so I would only use one cream cheese or if you do two then add more pumpkin. Just my personal preference as I love the pumpkin flavor and it came out very rich 2:1. Mine came out like soup for some reason. I think it needs to be whipped for longer than 5 minutes on high speed. We also couldn’t taste the pumpkin very much. Is it possible to use 2 cans? Love your site. Can you direct me to the link to buy the piping bags and attachments. 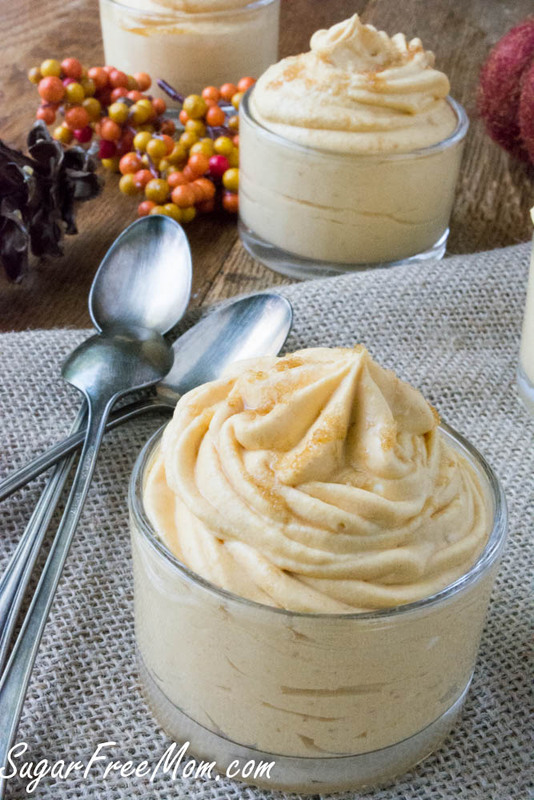 The one you use when making the LOW CARB PUMPKIN CHEESECAKE MOUSSE.